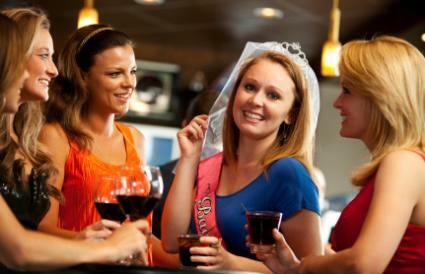 A bachelorette party is the last blast of the single life before tying the knot, so it's an important and fun occasion. Be sure to make it a memorable occasion for the bride-to-be, as well as for all of the other guests! You can get a head start on planning a great time by choosing a few time-tested games that everyone is sure to enjoy. There are several games created specifically for use at bachelorette games. Order a couple of games when you're shopping for supplies, and you'll be prepared for an evening of fun the night of the big event. Bachelorette.com is a great resource for all your bachelorette party planning needs including invitations, decorations and party favors. The site features a large section devoted to games for bachelorette parties. From the innocent to down right dirty, you can use your wild imagination to take the fun as far as you're willing to go. Pin the Macho on the Man: Remember pin the tail on the donkey? Well, it's not a tail you're pinning! Use your imagination on this one and let the naughty fun begin. Bachelorette Trivia Game: This saucy game is designed to test your knowledge of bedroom trivia. Of course, you don't have to purchase specialized games just to have fun at a bachelorette bash. If you'd rather enjoy a do-it-yourself game or two, consider one of the following ideas. Bride Trivia Game: This game requires a bit of preparation. Before the day of the party, ask the bride-to-be some obscure questions that not everyone may know about. When you start the game at the party, the fun will begin! I Never! : If you're looking for a perfect drinking game that everyone will enjoy, consider an old-fashioned round of I Never! Everyone participating will have a chance admit something outlandish that they have never done. After the person speaking finishes, everyone who HAS done the thing described has to take a drink. Weenie in the Bottle: This game is hilarious. You'll need some hotdogs, a bottle with about a 2-inch opening, and a roll of string. For each contestant, tie a length of string around her waist, and leave one loose end long enough to reach below her knees. 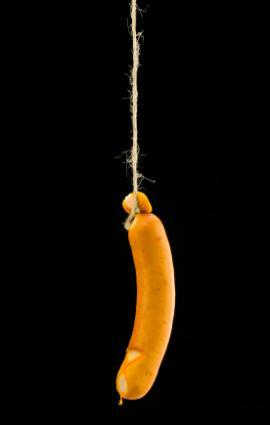 Tie the end of that string to a hotdog so it hangs down in front of her. The object is for each contestant to take a turn trying to get the hotdog into the bottle in the shortest amount of time without using her hands! The one with the shortest time wins. Scavenger Hunt: Take a traditional party game and give it a twist for the bride-to-be. Before the guests arrive, write out several lists of items that everyone must find or do before the evening is over. This game is best played at a bar, nightclub or gaming area with a somewhat rowdy and fun-loving crowd. The winning team can receive prizes for getting everything first. Common items on a bachelorette scavenger hunt include items like lipstick, a man's cell phone number or getting another patron to draw a tattoo on your arm. Story Circle: Have everyone sit in a circle or around a table. Write a sentence about the bachelorette on a sheet of paper, covering it with a large envelope on the top. Leave only the first line visible and a blank line visible. As each person adds another sentence, she pulls the envelope down over the top sentence. This way, no one knows more than one line of the story. Have two or three versions circling the group at the same time to keep everyone busy. After completing the stories, pull them out of the envelopes. Read them aloud to the group for some girly giggles and uproarious laughs. Wedding Night Chat: Gag gifts are usually part of the party. The party hostess records who gave each gift so the bride can write thank-you notes later. The hostess writes down the exact phrase the bride says as she opens each gift. When all the gifts are unwrapped, the hostess tells everyone that she knows exactly what the bride will say to the groom on her wedding night. She then reads each response to the gifts. Depending on how risqué the gifts were, this game may end in sidesplitting laughter. Drink or Dare: This twist on Truth or Dare is only for the 21-plus crowd, and there should be a designated driver. The game is played the same way, but the choice is between taking a drink and doing a dare. Just make sure no one overdoes it. Alcohol poisoning can ruin the evening. Bachelorette party games are just the ticket for some tantalizing (and possibly a bit naughty) fun. Before you begin, take stock of the bride-to-be's personality and style. The level of craziness should not go too far, because you want the guest of honor to be comfortable and happy during her party. Use your best judgment to ensure a fun evening for everyone.